April Fool’s 4 Miler in the Snow again! 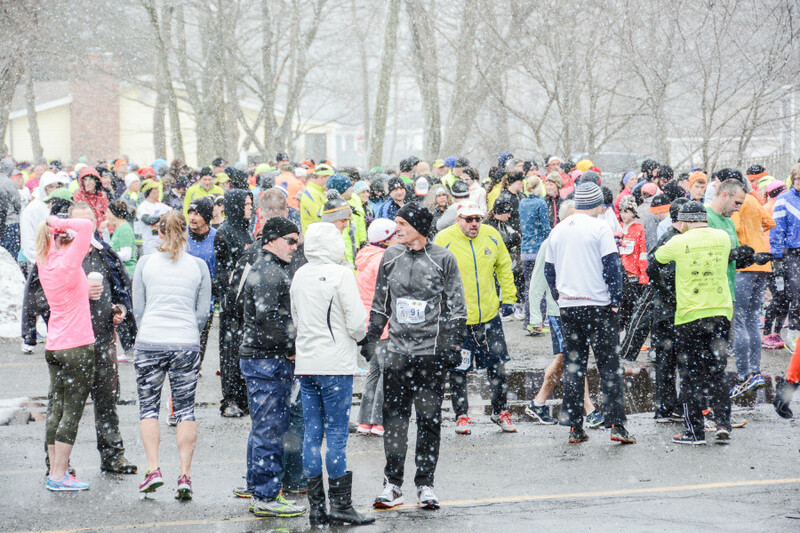 I’ve run this race six times and this is the second time that it has snowed. Often there are large snow banks in the back of the parking lots. Some years the snow banks take up a lot of space. This year the snow banks were average, but it started snowing on Friday. From my office in Cambridge there were times when we could not see Boston just across the river! It literally was a white out. While plentiful, the flakes were small and no match for the warm air and ground. No one expected this to amount to much more than a nuisance. It was my turn to drive and it was both hands on the wheel. As we approached Salisbury we saw three cars off the road and down the embankment between the highway. I’m not sure I ever hit the speed limit, but as we got further north my speed kept going down. The last 10 miles or so I drove 45 to 50 mph and very few cars passed me on a 4 lane highway. I had to be extra cautious changing lanes. Others said they saw as many as 10 cars off the highway.So while the snow wasn’t deep it was slushy and slippery. I drove up with Katherine Kulig, Rowena Hakkaoui, and Diarmuid Cahill. Lately I’ve really been working on car pooling and often we have a full car. As usual we had a great time talking as we made our way north. We found a spot near the bar and met up with Stephanie Lawson and Matt Sazama. 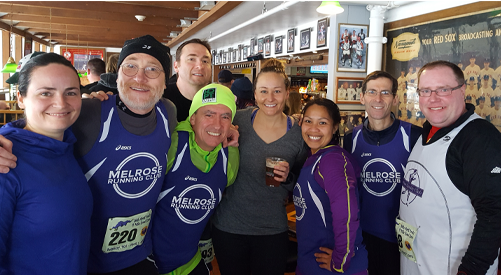 There were only six of us for the pre-race photo, but there were 9 Melrose Running Club runners at the race. We met Mark Rosenblum and Andy Brown before heading for the starting line. I saw Jeff Rushton’s name on the race results, but no one saw him at the race. As we crossed the road in front of the Winner’s Circle bar, the cars stopped and let about 500 runners cross. 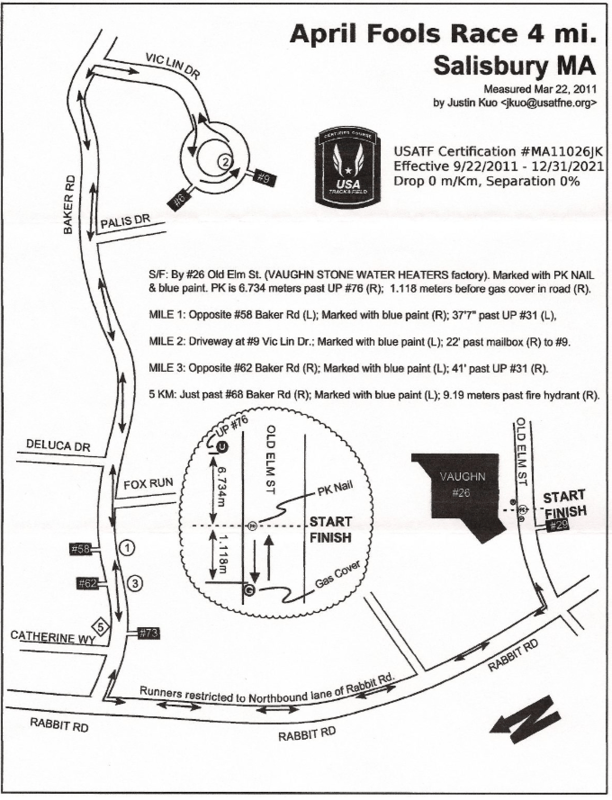 It’s about a quarter mile walk to the start line. Katherine left us to get in her warm-up run. The rest of us were rather casual and stood around freezing in the snow and having a few laughs. Mark and Katherine went towards the start line and Durm started heading that way also. I figured, what the hell and followed behind him. I’m still recovering from that 20 miler and didn’t plan on running hard. We started the race deep in the pack. The snow was wet and sloppy which made traction a bit of a challenge. Its a short distance from the start to the turn onto Rabbit Road. The crowd was thick and tough to get through. Durm and I went to the left of the crowd and ran on the left side of the center line quite a bit. Off to out left we could see plow trucks doing their job on I-95. Traffic was light on Rabbit Road, but there were a lot of plow trucks to keep an eye on. I didn’t feel like I was running that fast, but I kept passing people. As we approached the next turn onto Baker Road I could see that the intersection was several inches deep in slush and water. With a few careful steps and a hop or two, I managed to get through the turn without slipping or getting wet. Baker road is less traveled and not as well plowed. There were spots where I could feel my feet slip before they kicked off. Mostly I ran in the trails cleared in the slush by cars. A few times I got behind someone and decided to stay there. Then I ended up on top of them and had to pass. As we approached the turn onto Vic Lin Drive the lead pack started passing us. When I saw Katherine Kulig go by I thought she was the first place women. She ended up 3rd woman overall! Then I saw Mark Rosenblum go by while I was still on Baker Road. When I was mostly to the end of Vic Lin Drive I saw Durm pass me. Vic Lin Drive had received even less attention from the town than Baker Road. It was slippery and making the turn took conscious effort. Mile 2 was just after the turn. It was beginning to feel like a run but my knees were holding up and I felt pretty comfortable. Mile one was 8:50 and mile two was 8:51. Almost a minute slower than my previous runs. I stayed in line on Vic Lin Drive after the turn to avoid slipping. When I got back onto Baker Road I kicked it in. The road was still slippery and covered in an inch or two of slush, but I navigated the tire tracks and managed an 8:37 mile three. Many times during the race I could feel slush land on the top of my shoe. Fortunately I had worn my Brooks Adrenaline trail shoes so my feet never really got wet. At about 3.25 miles we turned back onto Rabbit Road. I knew we had less than a mile to go so I decided to kick early. I’d get behind someone and run in the same tire track, then I would move to the right and pass. When there were no cars I stayed in the lane and moved forward. I probably picked off 10 runners in the final half mile. Back at the bar one guy told me he tried to catch me in the final mile but I kept pulling ahead of him. And his hair was much darker than mine! As we approached the finish I knew it was a left turn, I just couldn’t see it. Visibility was poor and I was beginning to feel the kick. As we turned onto Old Elm Street I could see the finish line, the clock and a pretty good sized crowd. I tossed in the last shovel of coal and surged to the finish. The clock said something north of 35 minutes, but I had started in the middle of the pack. My official time was 34:24 for an 8:36 pace. My slowest time ever for this race. I felt like I left it all out there under these conditions, but I guess I just don’t have that much to leave. The photo to the left is from 2015. Conditions were actually worse this year, but I think I wore just about the some clothing! I was surprised to see Durm and Mark at the finish line. Conditions were so bad we decided to meet up at the bar so no one would have to stand around in the cold. I grabbed a bottle of water and we headed back to the Winner’s Circle bar to get some food, get warm and have a beer or two. The race began at 10 and we were back in the bar before 11. No one had a beer and a few people mentioned that they were not serving until 11! I decided to grab a ticket and head for the beer zone. Sure enough they were serving. 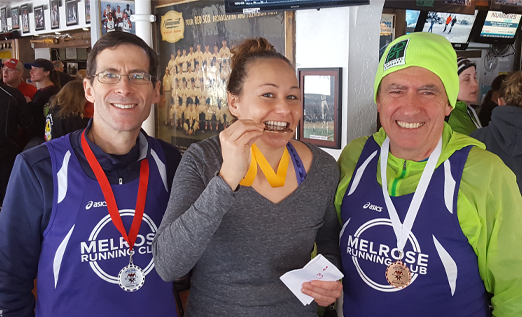 As the bar filled with runners all of the Melrose runners gathered together and swapped stories. Everyone felt good and were happy that they ran. In addition to Katherine’s 3rd place over all female finish, Mark Rosenblum won 2nd in his age group and Dum won 3rd place in his. 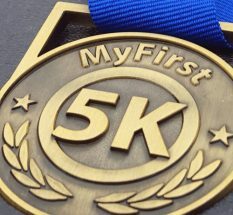 One third of our runners won a medal! They had some hot pizza for us, but on a cold day like this they couldn’t keep up with demand. Ipswich Brewing was pouring IPA and Ipswich Ale. I started with the IPA and switched to the Ale. I forgot how good Ipswich Ale tastes. We hung out for an hour or so and watched cars plow through the berm of snow as they left the parking lot. The weather wasn’t improving to we decided to get our team photos and head for home. I think this was the first running medal that Durm has won. Either way, he does look pretty excited. Rowena got a ride from Stephanie and they left before us. When I got to my car, someone had tucked two beer tickets into the drivers side window! Just what I needed! It was so humid that I had to keep the defrost on almost the entire trip up and back. Having a car full of people didn’t help much either. The ride home was quite the adventure. Traffic was heavier and the roads seemed to be in worse conditions. All I wanted to do was get off the highway and get home. But, I drove 45 mph most of the way down I-95 and didn’t have too many people pass me. We got some snow here too. Not happy… though warmer weather is on the way. Run fast, Andy. Ugh, I am so over the snow. Here’s hoping that was the last of it for you. I would definitely do any race that had an IPA at the finish. Talk about perfect ending!